Bollywood churns out the maximum number of movies every year, but only one of them beats all others and becomes the biggest grosser of the year. Delivering the biggest grosser of the year also means your movie is watched by the maximum number of people in that particular year on the big screen. In this day and age, with prices of movie ticket soaring, piracy and various options for entertainment (like television), it’s tough to bring audiences to theatres. Salman Khan leads his contemporaries by a distance with a staggering count of 8 (9 if we include Kuch Kuch Hota Hai). What makes it even more special for Salman is the fact that, he is the ONLY superstar with two biggest grossers of the decade. Maine Pyaar Kiya and Hum Aapke Hai Kaun were the biggest grossers of the 80s and 90s respectively. Apart from the 5 biggest hits of the year to his credit, Shah Rukh Khan has given the 2nd biggest hit of the year for a record 8 times – Deewana (1991), Karan Arjun (1995), Dil To Pagal Hai (1997), Mohabbatein (2000), Kabhi Khushi Kabhi Gham (2001), Kal Ho Na Ho (2003), Main Hoon Na (2004) and Rab Ne Bana Di Jodi (2008). Salman has delivered Top 2 biggest grossers of the year three times. Hum Saath Saath Hain and Biwi No. 1 in 1999, Bodyguard and Ready in 2011, Ek Tha Tiger and Dabangg 2 in 2012 (expected). Ajay Devgn has three 2nd biggest grosser of the year to his credit. Phool Aur Kaante in 1991, Pyaar to Hona hi Tha in 1998 and Golmaal 3 in 2010. Akshay Kumar came close to giving the biggest hit of the year as many as 4 times. Mohra in 1994, Welcome in 2007 were the 2nd biggest hits while Singh is King and Rowdy Rathore came 3rd in 2008 and 2012 respectively. 2006 belonged to Hrithik Roshan as Dhoom 2 and Krrish were the 1st and 2nd biggest hits of the year respectively. List of Bollywood highest-grossing films in overseas markets (USD). 3 out of 8 of salman–saajan, hum saath saath hain and no entry—were not the solo releases. So he has only 5 highest grossers as solo ( 3 out of which came from his peak time , i mean dabangg, BG and ETT, means before dabangg , he has only 2 highest grossers). and SRK has 5 highest grossers and all are solo hits. moreover he has most no. of second highest grossers and few of them had almost same earning as compared to the highest grosser of that year. both saajan and hum saat saat hain has salman in supporting role to sanjay dutt and monish behle respectively. If we include these films in salman credit den i have to say Anupam Kher has most no. of biggest grossers dan any other actorr. Khans R nothing in front of him. “kamaal karte ho yaar indicine waalo” bada mazaa aajata agar yeh post kal yani ke pandeyji ke birthday par post karte toh.Chalo teekh hain Salman khan 9 movies = srk 5 movies + aamir 4 movies. Dhanyawaad indicine waalo yehi article ke liye hum intejaar kar rahe the. Those who were saying Salman Khan was nothing before 2010 can take this. IMHO he has always been a huge star. Just that, his choice of films, favours for friends, controversies, legal cases.. all made an impact on his career. Now he has no girlfriend, he has managed to stay away from major controversies and is concentrating on his career. I hope he makes better film choices… if he manages to mix comedy (he has been successful with Partner and No Entry) and masala action.. and not repeat himself too much, he will remain the top star for a long long time. 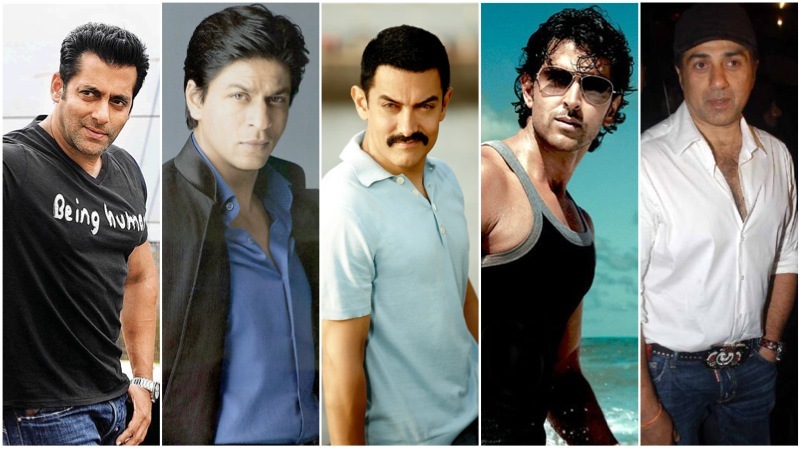 He still is the youngest looking Khan (of the three khans) in the industry. No entry,saajan,hum aapke hain kaun,hum saath saath hain were all multistarrers movie.only 4 solo movie of salman were biggest grossers of the year. No entry,saajan,hum aapke hain kaun,hum saath saath hain were all multistarrers movie.only 4 solo movie of salman were biggest grossers of the year.srk and amir had highest solo grosser of the year. got the answer srk fans? grow up lil kid…grow up? Monish behl? that’s a joke of decade………..
though em not a big big fan of salman…..
but hv seen SRk & amir movies on cinema…. moreover, KKHH had Salman too…..
so, grow up lil kid…. one more thing em planning to watch Dabaang 2 soon on cinema??? but i don’t like masaala filcks…..so hv delayed till..but ll watch it this week…. Hahahaaaa! I am getting smells of burning jealousy against Salman Khan since he is having maximum numbers of biggest grossing films!! They are saying HSSH, Saajan and No Entry are not solo movies. Indicine has just mentioned the films they have acted in. Imagine HSSH, Saajan and No Entry without Salman Khan! There would be nothing to watch. Are Devdas (Co-starring Jackie Shroff), Veer-Zaara (Co-Starring Manoj Bajpayee and Amitabh Bacchan), OSO (Co-Starring Shreyas Talpade and Arjun Rampal and all other actors in Bollywood in special appearances) KKHH (Salman playing a very important role in it), 3 Idiots and Dhoom 2 Solo films??? There is no solo film or in another word, an actor alone can’t make a movie. A film is a teamwork. The actors who give the most remarkable performances in the films are remembered and reckoned for those films. @nikki and xzone if you talk about multistarers than kuch kuch hota hai had salman khan, OSO had arjun rampal and guest apperence many actors in one song. 3idiots had r madahvan and sharman joshi. dhoom 2 had abhishek and uday chopra, border had suneil shetty and akshay khanna and many other actors so stop bragging about salman and other four actor are not even salman’s league. the more you haters hate him the more bigger he is gonna get. @ahmed..don’t talk non-sense.if u r comparing sanjay of saajan with shreyas of OSO , then hats off to u.i have nothing to say now.perhaps u know better than me abt bollywood. But fact is fact and i only summarized it.thats it. Well well you already read that post about most successful since 2000. Sallu is behind younger actor Hrithik.